The Google search page is, ordinarily, one of the most pristine places on the internet, displaying the Google logo, a search box, and two buttons. 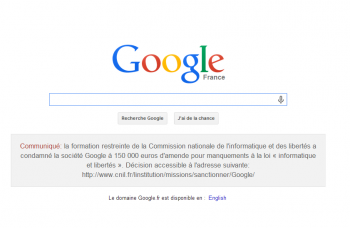 However, in France, at least for the next 48 hours, the Google search page must be accompanied by a notice stating that France's Commission Nationale de l'Informatique et des LibertÃ©s (CNIL) determined last year that the company had failed to address privacy and data protection questions, and was subsequently fined €150,000 (around $204,000), the maximum amount allowed by law. The message must also contain a link to CNIL's decision, which Google is currently trying its best to appeal. "Google has always maintained that page in a virgin state," argued attorney Patrice Spinosi, but nonetheless, France's top administrative court still upheld the CNIL's decision. Google was given a three month deadline to change the policy, which it failed to meet, and as such was subsequently fined and forced to display the message on its homepage. CNIL has been looking for ways to multiply the fairly low fine amount, which will barley leave a dent in Google's massive coffers. Google is also facing action in the UK, Germany, Italy, and the Netherlands regarding its controversial privacy policies.